The sun may set a little earlier now, but that doesn’t mean you have to start hibernating. Add a few things into your weekly routine that remind you of summer and sunshine to keep the winter blues at bay. This delicious, refreshing Cucumber Mint Lemonade is the perfect example. 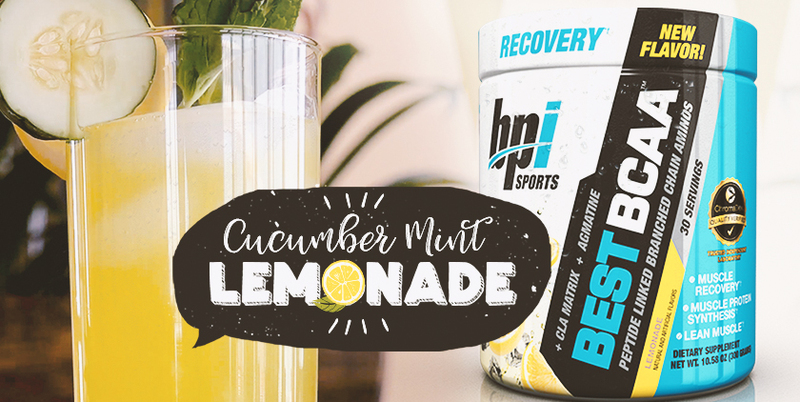 Cool cucumber and fresh mint mingle with the sweet yet tangy bite of lemons to take your taste buds right back to a day by the pool. Drink it as a replacement for soda at meals and/or reward yourself after the gym! Those no wrong time to squeeze in the recovery and muscle-building properties of BCAAs. Chop half the cucumber. Add the chopped slices to a large sauce pot. Add the lemon juice, sugar and ½ of the mint leaves to the pot. Place the pot over medium heat. Cook, stirring occasionally, until the sugar is completely dissolved (about 5-7 minutes). Pour the liquid through a fine mesh strainer to remove the cucumber and mint. Add the liquid to a large serving pitcher. Slice the remaining half of the cucumber. Slice the lemon. Add the Best BCAA™, sliced cucumber, sliced lemon and the remaining mint leaves to the pitcher. Top with club soda. Stir. Want to cut back on the sweetness? Take out the sugar all together! The sweetness of our Lemonade Best BCAA™ should be plenty. Not a fan of carbonation? Substitute regular water for the club soda. You can also try replacing the mint with basil for another straight-from-the-garden twist.